Now available at Wearing Clouds! Super Absorbent will a one-of-a-kind print! Rearz Safari now available at Wearing Clouds! We are very excited to bring you this amazing diaper! 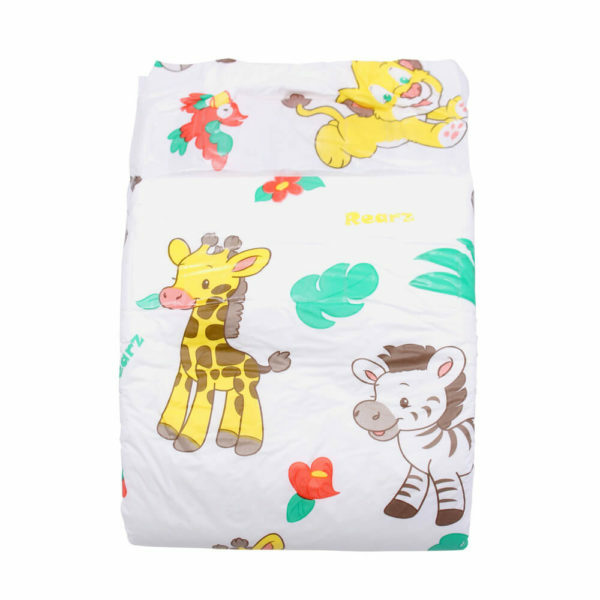 Similar in build to the Rearz Princess, this diaper is very thick and super absorbent. It features a fun all around print with six unique animals on it! There is Griffin the lion, Zack the zebra, Marty the giraffe, Lilly the hippo, Alex the monkey and Johnny the parrot! Want to buy packs? Visit our friends at Cooshie Tooshiez! Check out this list off all the amazing features the Rearz Safari has to offer! Our customers have been asking us to get this diaper for quite some time. We are so happy to finally have these in stock and ready for your enjoyment!